The replacement of natural fynbos vegetation with pine plantations in the southern Cape, and the subsequent invasion of surrounding land by invasive pine trees, significantly increased the severity of the 2017 Knysna wildfires. This is one of the findings of a study published in the journal Fire Ecology by a research team from the DST-NRF Centre of Excellence for Invasion Biology (CIB) at Stellenbosch University, Nelson Mandela University, SANParks, and the CSIR. The aim of the study was to assess the climatic, weather and fuel factors that contributed to one of the worst fires ever recorded in the region. Over four days in June 2017, the Knysna fires burnt 15,000 hectares, claiming the lives of seven people and destroying more than 5000 hectares of commercial pine plantations and over 800 buildings. 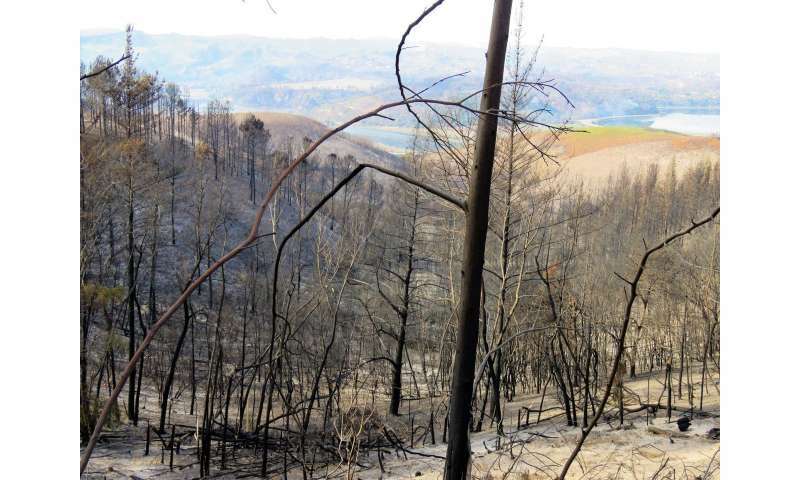 The researchers used satellite imagery to compare the landscape before and after the fire, including the types of vegetation covering the areas under study. This information enabled them to estimate the amount of biomass consumed by the 2017 fire. One of the main findings is that the severity of the fire was significantly higher in plantations of invasive alien trees and in fynbos invaded by alien trees, than in uninvaded fynbos. And while the weather conditions were extreme, they were not unprecedented, as similar conditions occurred in the past at a rate of approximately one day every three years. Additionally, the severity of the drought that preceded the fires by 18 to 24 months was higher than ever recorded in the historical weather record, and this contributed significantly to the impact of the fire. 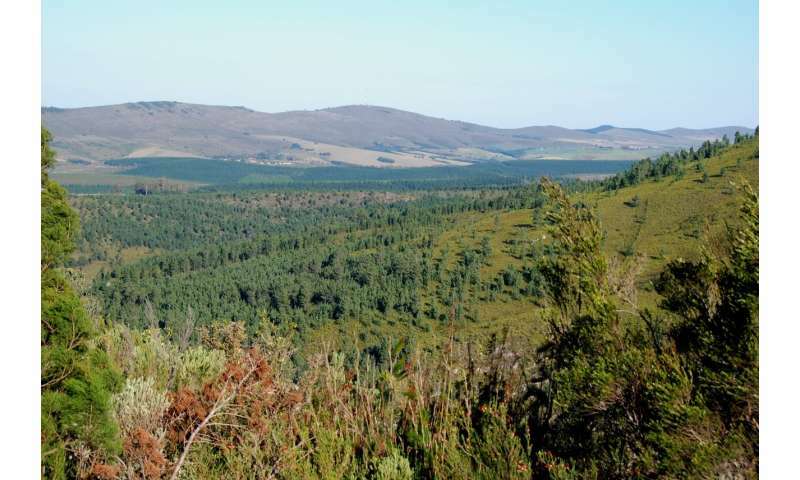 It is estimated that pine trees have invaded more than 90 percent of the Garden Route National Park's fynbos vegetation at various densities. Additional invasions by Australian Acacia and Eucalyptus species cover a further 29 percent and 14 percent respectively: "By increasing the amount of fuel available to burn, the fires become more intense and more difficult to control," he explains. Van Wilgen warns, however, that events of this nature can become more frequent as the climate of the southern Cape becomes more hot and dry, and as the extent of invasions increases. "The conditions that exacerbated the severity of the 2017 Knysna fires will occur again. People need to stay vigilant and implement fire-wise practices, and, more importantly, steer away from placing developments in high-risk areas in the long inter-fire periods. Of the land in the altered category, most (78 percent) was either commercial plantations of invasive alien trees (52 percent), or other land invaded by alien plants (26 percent). A relatively small proportion of the burned area was natural forests (4 percent), or thicket (2 percent). A policy of regular prescribed burning, practiced by the Department of Forestry in the 1970s and 1980s with the dual goals of rejuvenating the fire-dependent vegetation and reducing fuel loads, were halted in the late 1980s. Fire management then shifted to a focus on fire suppression to protect forestry plantations and residential developments, resulting in substantial fuel build-ups in natural vegetation. Leaving fynbos unburnt for long periods can treble the fuel loads, as has been shown in studies elsewhere. In addition, invasion of these areas can further increase fuel loads by 50 to 60 percent. The Knysna's population grew by over 70 percent over the past 20 years, from 43 000 people to 74 000 people in 2018.